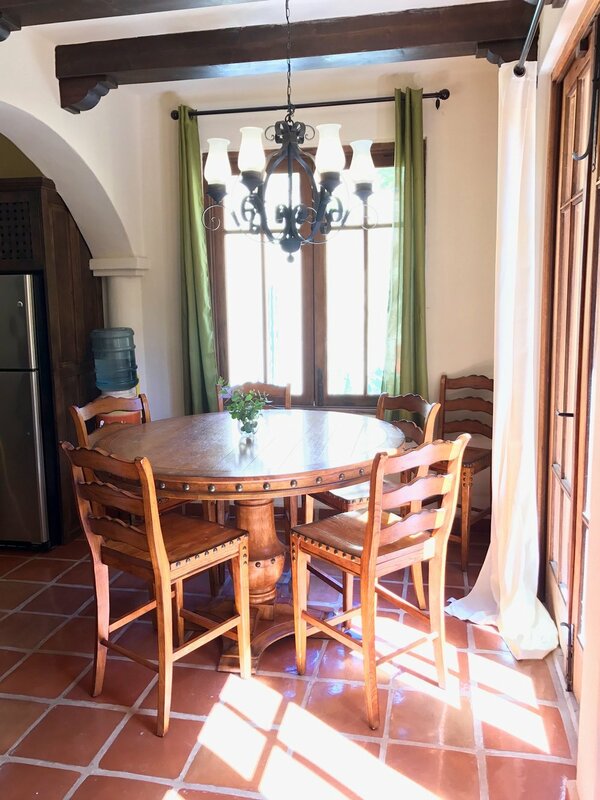 With the most sought-after location, Casa Carmen is a cleverly designed villa with 5 cozy rooms, perfect for a group of young travelers who all want their own space, or a family with young children. While the rooms are compact, the sun deck and viewing tower are vast, with a grill station and spectacular views of the mountains, golf course, and neighborhood. Casa Carmen is also next door to Casa Del Sol and Casa Roja, so all three villas can be rented together for larger groups or multiple families traveling together. Designed for families with children- king bedroom and two children's rooms all on the ground floor, open onto main living area. Queen bedroom and third twin bedroom upstairs. Pack n' play crib, toddler cot, dining booster seat, plastic ware, toys, puzzles, games, and child's life vest provided. Sun deck with lounge chairs, dining area, pergola, and grill station. 50" Smart TV in living room with access to hundreds of movies and shows through Netflix and Youtube. Please contact us today to reserve Casa Carmen for your next vacation.